Captain America #193, January 1976 | 'TAIN'T THE MEAT… IT'S THE HUMANITY! After taking a closer look at John Byrne’s excellent Hawkeye cover from The Avengers #189, and John Romita, JR and Bob Layton’s wonderful Iron Man #126, I thought it only fair to highlight one of the most iconic comic book covers of all time — Jack Kirby’s Captain America #193. Published by Marvel Comics in January 1976 this cover featured possibly the most quintessential image of Cap to ever grace a comic book. Kirby, fresh from a four year stick at rival publisher DC, returned to Marvel and created some of the strongest work of his career; and this is one of his best. 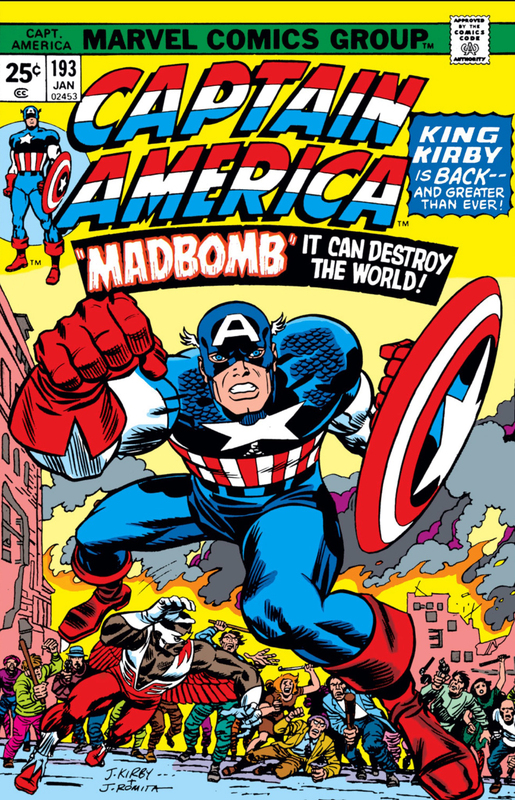 The issue marked Kirby’s return to the character he helped create over 30 years before and he celebrated the event with an explosive and eye-catching cover — Cap just leaps off the page. The drawing was inked by another Marvel legend John Romita, and a great job he did too. Well… almost. As good as his inking is Cap’s face looks far more ‘Romita’ than ‘Kirby’. Still, that doesn’t detract from the image’s impact. The cover was so eye-catching in fact that Marvel used it repeatedly over the next couple of decades for all sorts of publicity and advertising material. Kirby’s artwork also appeared on a whole heap of licensed material, from T-shirts to die-cast toy cars. Indeed, whenever I think of the archetypal image of Captain America this is the one that always comes to mind. Great stuff.